This is not a gold monkey. It's not even a monkey, monkey. 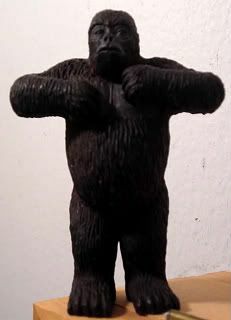 He's a Magnerine gorilla that I picked up (for work, no lie) from the Museum of Natural History. You know, it's a good thing that I haven't discovered a clearance store at that museum too, otherwise, I'd probably have the entire animal kingdom sitting in my cube at work. 1) Stephen Collins is on Twitter. Squeeee! 2) They're releasing Tales of the Gold Monkey out on DVD next year, with commentaries from Stephen Collins. Now. Let me tell you why in my little world this is totally the bee's knees. Ya'll know how much I love my television crushes. Tales aired in 1982 on ABC, a total adventure series about a hot ex-Flying Tigers pilot named Jake Cutter. It was set in the South Pacific, with a theme song I can still freakin' hum. It was classic Bellasario before there was such a thing. And it apparently conceived before Raiders of the Lost Ark, but not greenlit until after Harrison's success. That was also the year CBS produced a competing series called Bring 'em Back Alive, starring a very hot Bruce Boxleitner, another longtime crush of mine. Anyway, my show aired for only one season, which I totally just found out today. It's all about how Jake Cutter flies around the in awesome bomber jacket, doing somewhat sketchy cargo runs out of what I've thought was Bora Bora for the last couple of decades, but is actually the fictional Bora Gora. He was always getting into spy troubles, because of Sarah, his one true love, and also the government spy stationed on the island to keep an eye on the local Nazi and Japanese spies. Jake's BFF is the lovable and affable Corky - who was also on Black Sheep Squadron, which I don't remember, but totally watched reruns of, because of the hot boys in uniform. Robert Conrad I'm lookin' at you. Annnyway, Jake's other BFF is Jack, the Jack Russell terrier with an eye patch. For serious. And OMG, Roddy! McDowall! was in it as the bartender slash government official! So sad, but to be honest? My Friend Flicka, nothing. Bon Chance Louie is the role I'll always remember Roddy McDowell for. I'm telling you, I loved that Jake Cutter - he was the original cuteboy for me. Like, he predates Duran Duran, ya'll. Loved that Stephen Collins. Loved the theme song. Loved the show. This news has single-handedly made my freakin' day. I cannot wait for the DVDs to come out next year. And if they don't? I am so finally ordering that multiregion DVD set and ordering the ones from the UK, dagnabit. And, yes. Stephen Collins was totally the dad on 7th Heaven. Which I totally watched. I am amazed that you remember Tales of the Gold Monkey, but don't remember Black Sheep Squadron!!! I remember both, but didn't love either, although Jake was a cutie.